Formed in 2016 at the Cleveland Institute of Music (CIM), the Callisto Quartet brings together four dedicated and passionate musicians who share a love for chamber music. The quartet is currently one of six groups chosen to participate in CIM’s Intensive Quartet Seminar where they work closely with Peter Salaff and the Cavani String Quartet. Members Paul Aguilar and Rachel Stenzel (violins), Eva Kennedy (viola), and Hannah Moses (cello) are all accomplished chamber musicians individually and have attended numerous festivals.The ensemble was chosen to be the CIM Apprentice Quartet for 2017, a position which includes extensive education and performance activities throughout the Cleveland community and two full-program recitals, one of which will be part of the Cleveland Chamber Music Society’s concert series. 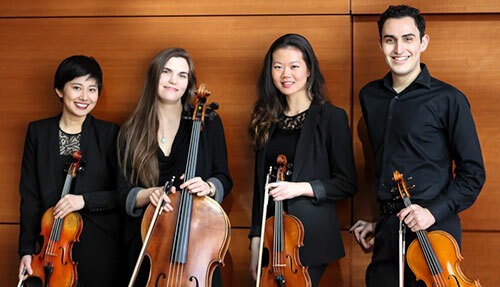 Quartet Amí was formed in September 2015 at Northwestern University. They have worked extensively with members of the Vermeer Quartet and the Dover Quartet. 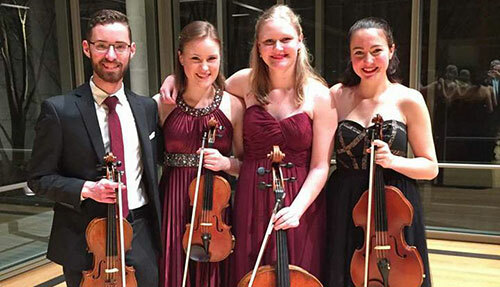 Miki Nagahara, violin, Natalie Lee, violin, Gabriel Napoli, viola, and Geirthrudur Anna Gudmundsdottir are currently seniors at Northwestern and are part of the university’s string quartet seminar, led by the Dover Quartet and Mathias Tacke. Formed through strong bonds of friendship, Quartet Amí is named for the convivial spirit of the ensemble and also hopes to convey the musical the goal of its members: not only is “Amí” an abbreviation of “friends” in many romance languages; it is also a combination of the words “a mí,” which, in Spanish, means “to me,” thereby evoking the quartet’s hope that every listener feels personally engaged by the music they hear. String quartet Bellezza was formed in the fall of 2016. 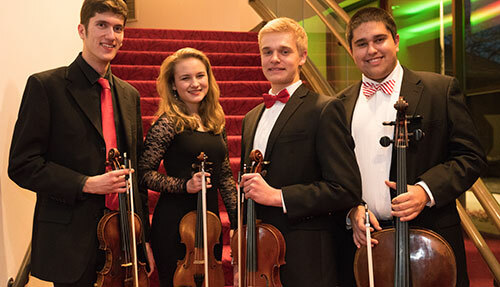 The group consists of violinists Masha Lakisova, 15, Robert Sanders, 18, violist Peter Dudek, 17, and cellist David Caplan, 17. They belong to Midwest Young Artists Conservatory, and love making music together. The Orion Trio was formed in the fall of 2016 at the Midwest Young Artists Conservatory in Highwood, IL, coached by Lyudmila Lakisova. 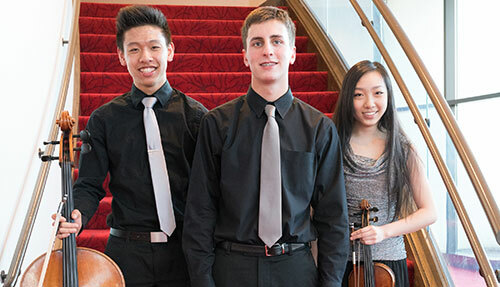 Its members are pianist George Dalianis, 16, violinist Rebecca Moy, 16, and cellist Haddon Kay, 17. All three are members of the MYA Symphony Orchestra.